It was one those words that make you go: "yep, that's me!". The fact is that I am interested in too many things, and nothing gets my undivided attention. I did not choose to be like this -- I am like this. Sometimes I wonder how it would've been if I were one of those people who are able to prioritise their time and are able to say to themselves "I'm gonna spend my time on this, this, and this; and the rest can "go to hell". Do they end up with a feeling that they do not know too many things that they should have. If I were able to get myself to spend my time with family, career, friends, and a couple hobbies, and nothing else, would I be a happier person? I can see that I could probably have a more fulfilling career because I'd devote more time and attention towards it, but would I lose out on other things? For example: I spend quite a bit of time and energy in learning about the nuances of personal finance and investments, and it had certainly been a very enriching experience (both emotionally & materially). My knowledge in this area makes me extremely comfortable about my money matters, about my financial future, etc. If I weren't a scatterbrain, I'd never know what I know about finance simply because it's totally unrelated to the rest of my life. My long term financial wellbeing would suffer from my own financial stupidity, and I'd perhaps even be robbed by some smooth talking scumbag financial advisor who'd put my money into some 5% front loaded 2.5% ER high turnover mutual fund B-shares under a 2% fee wrap account. How would it be if I didn't read about science and put my head in the sand thinking god will solve all my problems if I prayed hard enough? How would it be if I didn't know about the Law of Infinitesimals and took myself to a homeopath when I was miserable from an ear infection? On the other hand, I'd spend more time writing that Great American Novel, concentrate more on my career to perhaps become a kickass supergeek, take better photographs, perhaps bring about my Destiny that Sir Bowie wonderfully wrote about in the KMSA blog 22nd sept 2008. Life it seems is always being caught between what I want to do and what I have to do. Which way is a better tradeoff? All my life I've been hearing the crap about finding the right balance - can somebody please tell me where that annoyingly elusive balance point is? 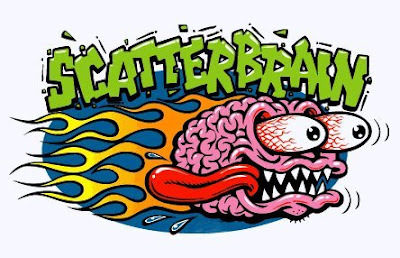 I too am a proud member of the Scatter Brain society. If we all got together, as we have through the KMSA, we would know just enough about everything, like staying in a Holiday Inn Express. Sometimes I know just enough to be dangerous. I've found that the elusive balance point actually is in perpetual motion. It's up to us to continuously shift with it. As my black bartender friend says, "It's nothin' but a move!" Get yourself tested for ADD. I did, and it changed my life on a fundamental level. My life is a WHOLE LOT EASIER without the 'machine gun of thoughts' going off in my head. BTW, people with ADD often gravitate into professions that benefit from ADD, like television! or was it yesterday afternoon? No, I'm sure it was last week. Damn, that sun is bright. Like a ... I wonder why some people enjoy being in the spotlight, but you never hear anything about loving being in the diffused light. Just something rolling around in my gray matter. Diffused Gray Matter. Is gray a color? Then what's grey? A colour? Not white, not black, but dark white. Is it really darkest before the dawn? If so, that would be a good time to steal your neighbors paper. Which reminds me of this brilliant blog I once read a long time ago about everyone named Brian scattering around the countryside. Where did I read that. Sir B... Sir.. oh, I forget. Great subject Sir Davyd. Something that afflicts many of us, and the comment on ADD is certainly appropriate, I think many of us have it, only difference is some are diagnosed, and the rest of us deal with it the best we can. My mind is a bit of a fart in a whirlwind, and what has helped me most is the practice of insight meditation. Calming the mind, and slowly learning to focus on one thing at a time. It is a very long process, one that requires a lifetime of practice, but very slowly it is improving my thought process so that I can be more focused on one thing at a time, and life as it is at that moment. May not work for everyone, it does teach patience, but I think it really helps. Barbara Sher wrote a pretty good book on the subject (sort of) that involves journal writing: Refuse to Choose. Sir Bowie once again you got in first with my joke i was going to write a reply too that fained me forgetting where i was and going off to do something else.. Thanks for all the kind words of concern from everyone... I really just need the Electricity cut off in my house and I would be cured..... Instantly... well no...i would go mad and eat the grass on the lawn. With all the new tech in the world and easy ways to CREATE.... and some off my peers getting seriously ill and dying around me ... i am finding life wayyyyyy too short... and am running round trying to fill it full LOL.. When I started reading this I swore it was written by Sir Bowie of (I belong to sixty clubs) Greenbriar. Fortunately, this is nothing like me as I would never digress in a blog for the sake of cheap laughs and man the new neighbors are playing their music loud. And it's music from when I was a lad, well maybe not a lad. When exactly was ELO popular? High School I think. I have a 30 year reunion this year. Somehow I ended up on Facebook instead of just MySpace. I have way too many passwords to remember. Remember the game show Password? Betty White got some sort of Emmy the other night. So did Tommy Smothers or was it Dicky? I never could remember which was which. Now that was in the 1960's or early 70's when we had a real war. Did you see where Warren Buffet is investing like 5 Billion Dollars in Goldman Sachs. That's like Sacks of Gold. How'd it get to be so late?